As Nick mentions, the M2 protein from influenza makes a channel for hydrogen ions within the viral membrane. 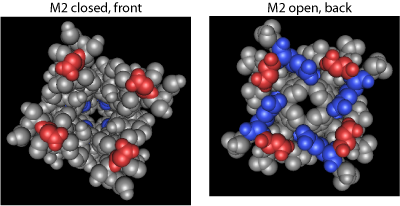 The channel controls the pH inside the virus by opening and closing. When the channel is open (top row), hydrogen ions pass through the channel and drop the pH. This makes the interior more acidic and activates some of the viral proteins, a necessary step in viral reproduction. When the channel is closed (middle row), the passage of ions is blocked and the pH remains stable. One other interesting feature is the location of charged and uncharged residues. I used Cn3D to color the structures by charge. This makes the positively charged amino acids (lysine, arginine, histidine) appear blue and the negatively charged amino acids (aspartic acid and glutamic acid), appear red. Everything else is gray. 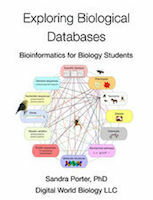 The pictures below show faces of the protein that are on the outside or inside of a membrane. Those faces show charged amino acids. Around the outside of the protein though, are uncharged amino acids. This is cool because that's what we would expect, hydrophobic or uncharged amino acids are those facing the interior of the lipid membrane. 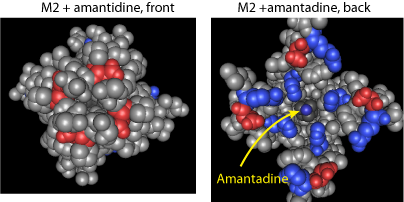 The images on the bottom row show what happens when the anti-viral drug Amantadine is bound to the protein. 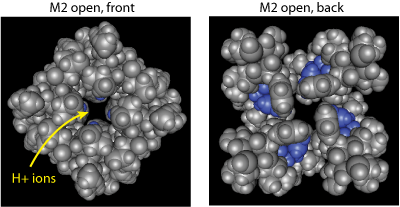 The drug keeps the gate closed preventing hydrogen ions from passing through the channel.